One of my favorite getaway spots ever is Tomales Point, the northern end of Point Reyes National Seashore on the Marin County coast. 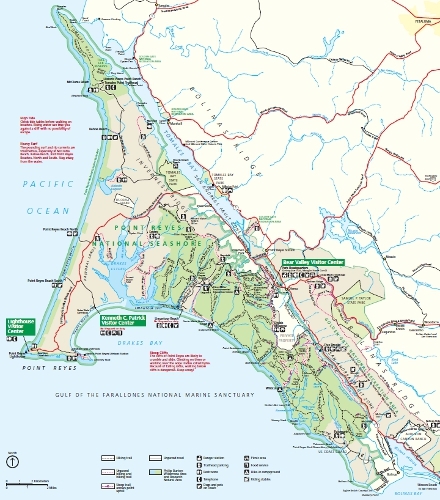 The visitor's center at Point Reyes is about an hour's drive from where I live, and Tomales Point is another half-hour from there. 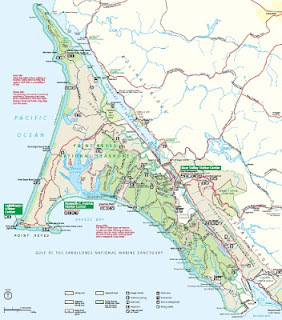 Each of the many times I've been over a long stretch of years I marvel that a place that feels as wild as Point Reyes does is so easily and quickly reached from San Francisco or the East Bay (it's not really wild: there are too many roads and trails and chemical toilets and pay phones to qualify). 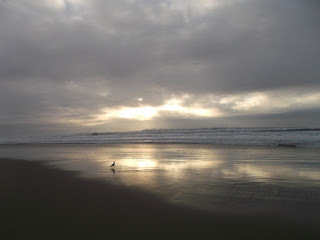 I drove out to the coast yesterday, drawn by a need to hear the pounding surf as much as anything else. 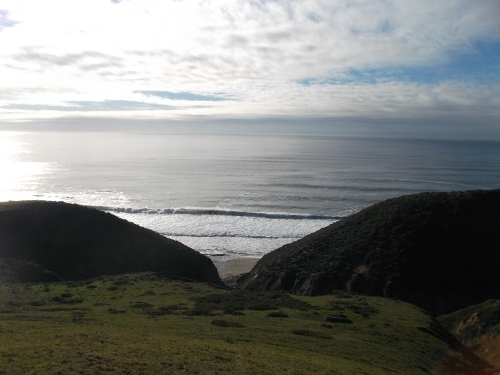 I don't think I'd been out to Point Reyes in all of 2012, sad to say. 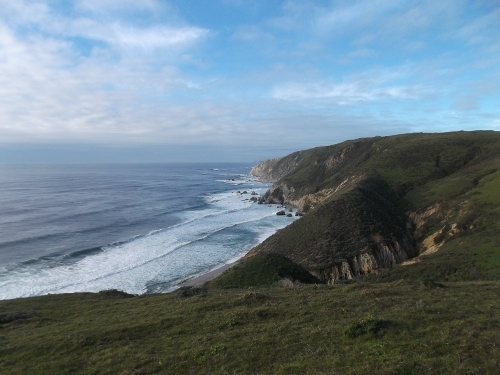 The Tomales Point Trail overlooks steep cliffs and the narrow strands of beach below them. The surf is treacherous, there are rip currents galore, and "sneaker waves" -- infrequent and irregular waves that reach far beyond the point that seems to be the furthest inland that the tide-of-the-moment extends -- can be lethal. 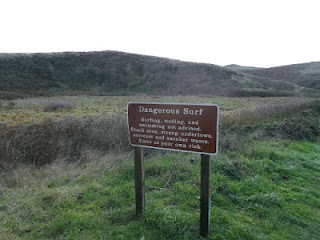 In fact, stopping in San Rafael on my way out to the coast yesterday, I saw headlines in the newsracks warning of three deaths caused by sneaker waves in the past week alone. The beaches are lonely, lovely, and steeped in a sense of the sea's seemingly limitless power. I know no better place to put life in perspective. I didn't make my way down yesterday. But at a particular cut in the cliffs, where a gully has deepened over centuries into a cleft, I've scrambled many times, alone or with a friend, down the steep deer-paths and onto the sandy stone that leads to a magnificently empty stretch of beach. When the tide is low enough, one can go even further south, over a low rock spit, to an even more remote strand. I've often had those hundreds of yards of coast all to myself, and marveled that this could be so some thirty or forty miles from San Francisco. On a clear day you can see the Farallon Islands, thirty miles out into the Pacific, etched sharp against the horizon. Here's the view from where I lingered for the longest while yesterday, sitting on a boulder embedded in the hillside. The surf's crash rose -- after an odd second's delay for the sound to reach my perch -- as majestically, if not as loudly, as one hears from the beach itself. 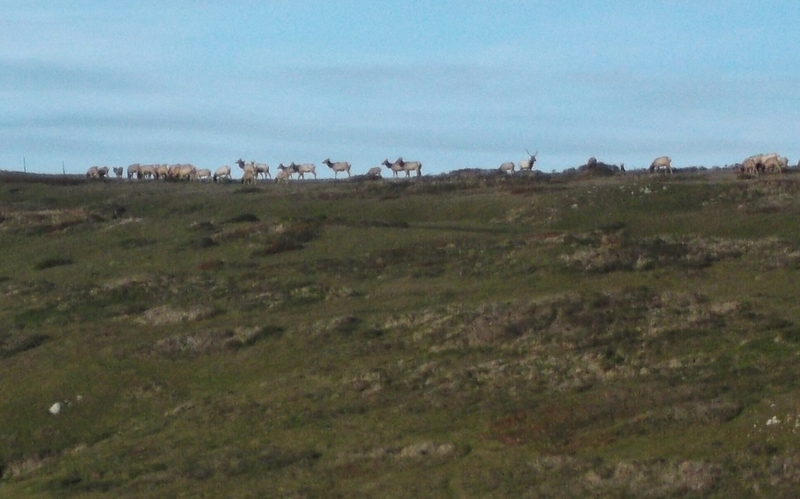 Tomales Point is also an elk reserve. 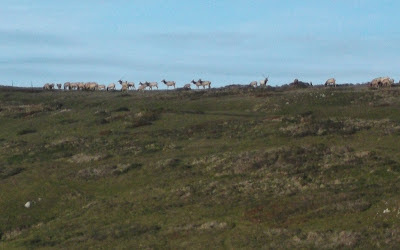 Can you make out the antlers on the elk standing about a third of the way from the right edge of the photo? Click on the image for a larger view. On the way back to 'civilization' I stopped at the next beach south, Kehoe, because McClure's beach, at the base of Tomales Point, was inaccessible due to a mudslide on the trail. It was nearly sunset. No pelicans, but plenty of seagulls and sandpipers. All in all, a fine day at the head of a year. Wonderful. We were in Inverness for New Years and headed to the lighthouse and South Beach. Such an amazing area.